The importance of colour-coded asthma treatment in patient education is well accepted. Traditionally, reliever medication inhalers are blue in colour and preventer inhalers brown.1 This custom is not always followed and the inconsistencies in the colour of inhalers create a lot of confusion. Marketing of the same medication in different colour inhalers and introduction of new drugs and combinations contributed to this predicament. The confusion created by the introduction of generic salbutamol in UK in orange-coloured inhalers has been previously discussed.2 Salbutamol in some countries comes in white inhalers with a blue cap. The colour coding of caps is never reliable as patients can easily change these stoppers. Across the world, inhaled corticosteroids (ICS) are available as brown, white, magenta, blue, orange brown, and red inhalers. Long-acting beta-agonists (LABA) are now marketed in green, blue, white, and greenish blue containers. The new hydrofluoroalkane propellant-based salbutamol is marketed in red or yellow jackets. Interestingly, their advertisement in a journal asks patients to reach for the ‘red’ in case of need. Inhaled steroids and LABA combinations were introduced in violet, red, and brown inhalers. So at any point of time a patient can be exposed to a collection of coloured inhalers with total uncertainty of its contents. Ideally, to have certain colours universally accepted would be most effective. But which colour can be used when drugs are marketed in combination? We recommend embedding on the inhalers, small coloured circles or dots. Colours can be assigned to different types of medications. Depending on the contents, the corresponding coloured dot should be placed on the inhaler. When it contains two medications the matching colour dots should partly overlap (Figure 1A). Following the tradition, acceptance will be facilitated by using blue for relievers and brown for inhaled steroids. We suggest green for LABA, yellow for anticholinergics, and black for long-acting anticholinergics. Consequently, one can easily make out that an inhaler with a blue dot contains a bronchodilator irrespective of the fact of where it was purchased, be it in London or in Muscat. a) Blue for beta-agonists. b) Brown for inhaled corticosteroids (ICS). c) Green for long-acting beta-agonists. d) Yellow for anticholinergics. e) Blue and Brown for beta-agonists and ICS combination. f) Green and Brown for long-acting beta-agonists and ICS combination. g) Blue and Yellow for beta-agonists and anticholinergic combination. h) Red to keep in reserve. Two overlapping coloured circles, one brown and the other green, convey that the inhaler contains ICS and LABA. Red can be kept aside for future use. We suggest that these identifiers be called ‘U dots’ (universal inhaler dots). To help patients with visual impairment,3 dots should have a slightly raised level with the order of colours reserved universally. 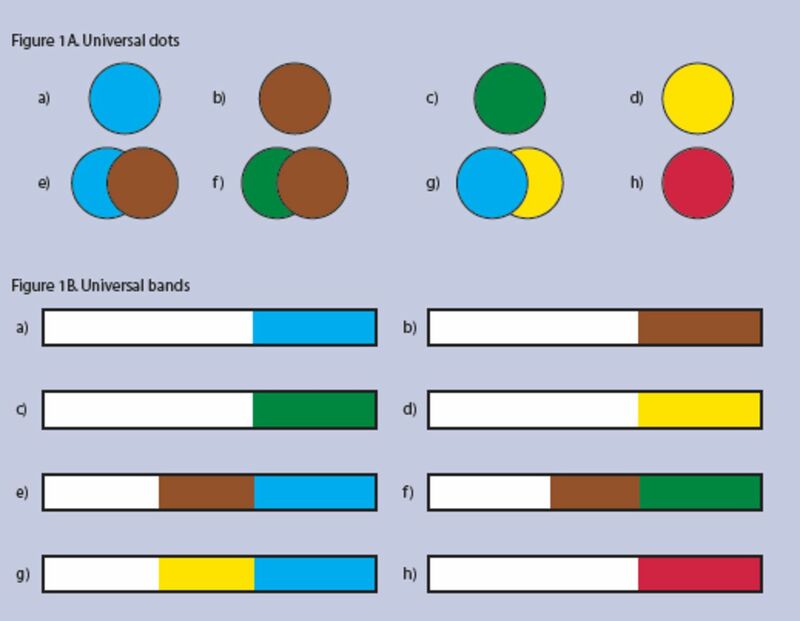 Following the same principle, an alternative identification, colour bands, can also be considered; these could be called ‘universal bands’ or ‘U bands’ (Figure 1B). Partridge,4 narrates his unsuccessful efforts to get responsible bodies interested in the problems created by the introduction of a generic salbutamol inhaler. He is not alone in raising the same concerns.1,5 Nevertheless, we hope to revive discussion around the convenience of having uniform colours for inhalers. We call upon all manufacturers to consider this concept and adopt the suggested colours for each class of medications. © British Journal of General Practice, 2010. (1986) Colour coding for bronchodilator inhalers. Lancet 1(8473):165. (1992) Distinguishing inhalers to aid blind people. BMJ 305(6863):1226. (1992) Coloured inhalers. BMJ 305(6858):890. (1993) Guidelines on the management of asthma. Thorax 48(10):1050.